Learn to be a good investigator and a successful retracement surveyor In the era of CSI, forensic science has taken on an unaccustomed glamor. The fact is, forensic science plays as crucial a role in the field of land surveying and title investigation as it does in flesh-and-blood criminology. Land location, the stability of property lines, and the sanctity of title documents are of utmost interest to the legal system in general, and the court system in particular. 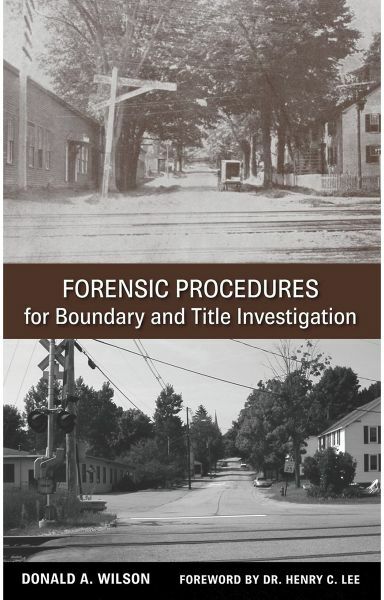 Forensic Procedures for Boundary and Title Investigation is the first book to present the application of investigative forensic techniques to the field of land boundary retracement. Covering basic logic, document research, and the interpretation of physical evidence on site, Forensic Procedures for Boundary and Title Investigation is an indispensable guide for? Surveyors faced with a difficult retracement having little or faulty evidence. Demonstrating the techniques that can be applied to boundary location, this fascinating and useful introduction to forensic science: Covers basic logic with tips for avoiding assumptions during the investigation that might result in error and bad conclusions Explains the standard operating procedures, common to all forensics fields, for the protection of scenes, evidence collection, and photography Provides detailed information on records research, reconstructing historical documentation, dealing with damaged documentation, and interpreting historic records containing antiquated measurements and wording Includes a unique presentation of physical evidence investigation techniques including interpreting stone, wood, and metal evidence found on site Takes an international approach, presenting universal investigative techniques and methods beyond the specifics of any single country Includes advice on using the Internet for research and how to draw upon surprising sources of historic information such as postcards, advertisements, and family histories This extensive treatment is sure to become a standard reference work for professionals in many fields related to land investigation as well as a practical text for the training of investigators in the evidence recovery and interpretative processes leading to successful property location and ownership.